Who’s Ever Heard of Coffee in a Box? A wonderful Friday morning to you (Internet denizen). While other “Blogs” might lower their standards by switching over to Casual Fridays, I’ll do no such thing. I simply won’t hear of subjecting you to that sort of policy. You deserve better. 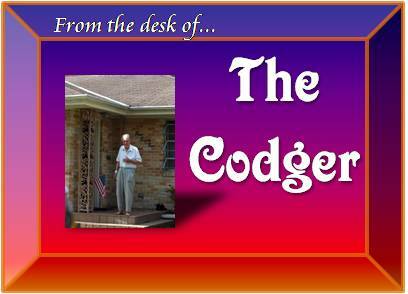 You deserve The Codger. If you’ll remember correctly, yesterday we were discussing how my son Brian and his wife Tammy were coming over for dinner yesterday. Well, they followed through and did it. Tammy brought that casserole she was making. It had macaronis, cheese, ham, and bread crumbs in it…I don’t imagine it was an authentic French recipe. They also brought along a boxfull of coffee. I’d never seen such a thing, coffee in a box. I said, “What did you go to all that trouble for? I have a coffee maker right here!” They even brought along a bag with individual creamers and sugar packets. I told Brian that I had plenty of milk in the house, and we would use that for the coffee. Those creamers will keep forever, but my milk was going to expire any day now if no one used it up. Those creamers are going to last me weeks, and that’s if I use one every day. I’ll probably alternate between the creamers and fresh milk. This whole time, I had forgotten that my granddaughter Fiona was coming to dinner. Sometimes I forget that she is related to Brian and Tammy at all. She is much more like her older brother, Max (also known as “M-Fixie”), despite the 17-year age gap between them. That reminds me: I am going to give Max a call to see how his job in California is going later today.